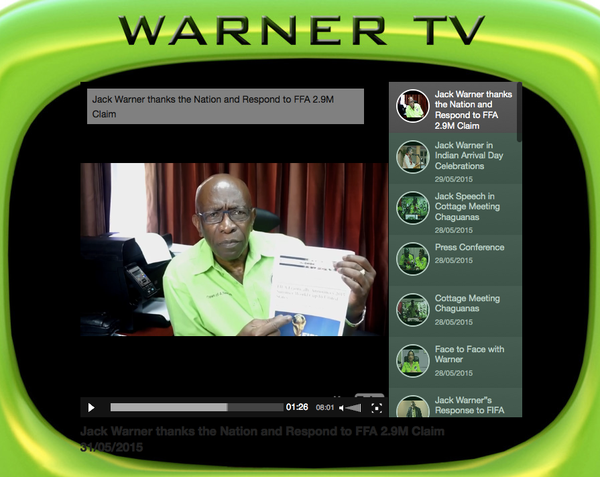 Jack Warner, a former vice president of world soccer’s governing body, FIFA, defended himself against corruption charges on Sunday by citing an article from The Onion, apparently unaware that it was satire. Mr. Warner, 72, who was arrested last week in connection with a wide-ranging criminal investigation by the United States Justice Department, held up the faux news report, calling it evidence of an American conspiracy, in a video statement that was uploaded to the web and then removed later in the day. The satirical article, published Wednesday under the headline, “FIFA Frantically Announces 2015 Summer World Cup in the United States,” mockingly suggested that, to placate American officials, the governing body had added a new tournament, which would begin the very same day. Mr. Warner, the leader of Trinidad’s Independent and Liberal Party, went on to suggest that American officials were primarily motivated by losing a bid to host the 2022 World Cup. “The U.S. applied to hold the World Cup in 2022 and they lost the bid to Qatar — a small country, an Arabic country, a Muslim country,” he said. He then speculated further that a second goal of the criminal investigation that has ensnared him was to force “Russia to give up the World Cup,” which it is hosting in 2018. After Mr. Warner’s error in mistaking The Onion for a news source was mocked on social networks, the video disappeared without explanation from his website and social media accounts. Two hours later, it was replaced by an edited version, missing 63 seconds and all references to The Onion. Mr. Warner is far from the first person to mistake The Onion for a genuine news source. In 2012, an Iranian news agency backed by hard-liners reprinted an Onion poll that found rural voters in West Virginia preferred Mahmoud Ahmadinejad to President Obama.